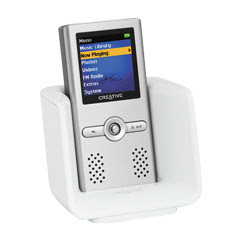 Besides it is also equipped with FM radio, voice recorder, a world clock with alarm functions allowing users to listen and even wake up to their favourite music or radio station on business trips or on vacations. This is a better MP3 player than Zen Stone, in terms of its rich features and will be retailed for S$179. Zen Stone has no screen and no radio but its simpler and tiny. The silver player is available now in 2GB capacity. Creative claims that transferring music to Creative ZEN Wav is also a breeze. But there will be an installation CD *Oh no* hopefully there would not be too much driver issues as experienced from Zen Vision and Zen V Plus users. However, good news for Windows Vista users, its supported! Creative ZEN Wav allows recording directly from CDs or other audio sources with line-in recording in WMA format. Creative ZEN Wav boasts up to 30 hours of playtime with earphones and up to 20 hours of playtime when using the built-in stereo speakers. Some new features which we had not seen before in other MP3 players are introduced in Creative ZEN Wav such as a Volume Limiter and an E-book function which allows users to read their E-book text file and listen to their favourite music at the same time. Now book and music lovers will love to hear and read using this gadget. myCreative Fansite Forum (Member Area) Thanks! "Some new features which we had not seen before in other MP3 players are introduced in Creative ZEN Wav such as a Volume Limiter"
"and an E-book function which allows users to read their E-book text file"
But we didnt know about the e-book function haha Thanks for highlighting!